You’ll be pleased to know that MOT tests are controlled and regulated by the government. 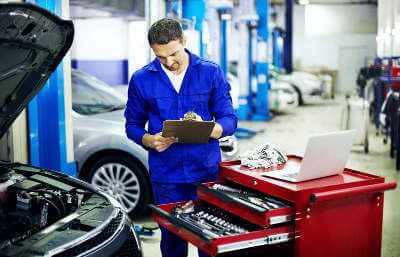 Particularly since the computerisation and centralisation of MOT services, MOT testing has become much simpler and more transparent. Get your MOT check quotes from us!. For added peace of mind, MOT testers are all assessed and passed by the government, whilst their testing centres are all connected to a central government database. The data going through this database is monitored and regulated at government level to help ensure road safety standards and check the MOT Scheme remains effective. Furthermore, for that added layer of confidence, MyCarNeedsA.com only ever work with approved suppliers. The items checked on an MOT test are set by the DVSA (Driver and Vehicle Standards Agency), previously VOSA. This means that the exact same items are checked during an MOT test in the Outer Hebrides, as they are in Central London; it’s a level playing field and keeps things fair. The main items on the MOT checklist fall into six categories. These are interior checks, exterior checks, under bonnet checks, under vehicle checks, emissions and brake testing. Will cover all vital checks from within the vehicle, necessary for driving. These include the stability of your seat and seatbelt, along with the full-functionality of your mirrors and warning light controls (indicators, headlights, etc.). Finally, the tester will confirm the vital controlling functions of your vehicle: your gear lever, steering wheel and pedal controls are all in full working order. The exterior checks are the largest category and will account for all the vital components of the external body of your car. These include: the hardware of your warning lights, headlights and hazard lights; your bonnet and boot along with the overall framework of your car’s body and finally your shock absorbers. The under bonnet checks will inspect and verify and validate the vital hardware for your vehicle’s drive. The MOT tester will check under the bonnet to ensure that there are no components missing from your car’s braking, fuel or exhaust systems and that all are properly integrated and justly connected. They will also check the steering/power steering components and that your suspension is in place and in good order. The under vehicle checks form the bulk of an MOT and will firmly test the your car’s most fundamental components exhaustively. Including the exhaust itself, your tyres and wheels will be validated and tested for wear and tear; your suspension and brake hardware will be checked and your fuel tank and connecting systems will be stress tested. Frequently, it’s these tests that can form the bulk of a failed MOT’s defects. This part of the test checks the level of pollutants your car emits from its exhaust. There are prescribed EU law regulated levels and in order to pass, your car’s emissions must be within the defined parameters. As they are the most important part of a car’s safety, your brakes will receive a mandated singular examination during your MOT. Both the structure and efficiency of your car’s brakes will be judged during the MOT test. The most common faults found on the brake test are; worn brake pads/shoes, uneven braking, leaking brake fluid and handbrakes not performing to required MOT standards. Where Can I Find An MOT Checklist? If you would like the full, exhaustive MOT checklist, as issued by the DVSA, it can be found on the UK Gov site here.